The founders are Spanish and French. Their company is Irish. Their customers are mostly Americans. The story of Happy Scribe is impressive. It’s even more impressive when you consider how quickly this business came together. In February the co-founders hadn’t even thought up the idea. In May, they didn’t realise who their most lucrative clients were. Today, they’re operating to make their product better and better. 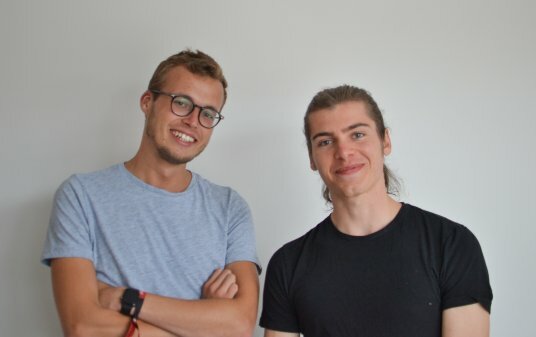 André Bastié and Marc Assens developed a transcription software system that costs significantly less than just about any other business in the market. Upload an audio or video file and get a written transcript back in just a few minutes. It all costs about €0.09 a minute. That’s about half of what other services charge, according to Bastié. The transcripts come back much faster too. Bastié says back in March, while he was finishing his master’s degree in electronic commerce at Dublin City University, he had to transcribe several long interviews for a research project. Anyone who’s had to transcribe a lot will tell you it takes a lot of time. Bastié estimates he spent about five hours for every one hour of audio. He and Assens, who was working at DCU as a research intern, tried to think of a better solution. The pair created Happy Scribe, licensing Google software. As word spread around the university, more academics wanted to try it out. Over a week in April, they incorporated their business and launched the website. Ireland’s familiarity with startups actually helps startups get off the ground. Compared to their home nations of Spain and France, setting up the business here was easy. At the time, the team thought that was as far as the idea would go. However, a little publicity brought in a lot of customers from far away. In May, the Poynter Institute’s blog featured Happy Scribe. You may have never heard of Poynter, but just about every journalist in America has. It’s an academic centre in Florida that teaches journalistic skills, advocates for journalists, and shows off the stories behind the stories. After the Poynter article, traffic to Happy Scribe’s page exploded. Journalists, with tight deadlines, fell in love with the Happy Scribe service. There were so many customers, the servers couldn’t handle it at first. “They save a lot of time,” says Bastié. Bastié says they’ve already transcribed several hundred thousand minutes of recordings. In my experiencing, writing stories for both television and websites, I can attest to the appeal of Happy Scribe. Transcribing is that part of the job that is necessary but SO much less fun than interviewing people and writing stories. At times in the past, I thought about why that sort of product doesn’t exist. Features on my phone can translate speech to text, but fixing errors on the phone took more time than simply transcribing the interview myself. So, for this story, I tried out Happy Scribe, putting a recording of my interview with Bastié into the system. There are flaws. The transcription is far from perfect. I generally had a good idea of what the sentences were saying, since I was there for the interview. However, it takes a lot of reworking to make the transcription accurate. Bastié admits that the service will only ever be as good as the audio captured. Poorer quality audio (recorded phone calls or recordings in loud rooms) will lead to poorer quality transcriptions. In the case of this interview, there was one flaw that makes it harder for a computer to understand: Bastié spoke English with me but with a slight French accent. Still, Happy Scribe has a few features that help save time later, including a page that plays the audio for the text you’re editing, making it easier to go back and fix mistakes. By using the Google software, Bastié says they have the chance to utilise several decades of work to perfect speech-to-text technology. It also makes it possible to transcribe dozens of languages and accents. It wouldn’t make sense, Bastié says, to redo the work that Google has already done. Instead, they’re focused on the user experience and improving the accuracy of the transcripts. They may also work with other companies to incorporate Happy Scribe into existing software. Bastié says the pair have launched the business without any investment, besides taking advantage of DCU programmes like the UStart Student Accelerator. Right now, the €0.09 a minute already covers all of the business expenses and even generates a profit. These two young men turned an idea into reality after just a few months. Now, imagine what they’ll do next.